What are the opportunities and complications of a match between city challenges and game designers? How can policy officers or ‘problem owners’ cooperate with game designers to put a specific issue, problem or contribution to a public good ‘on the map’, and in turn how can game designers best pick up these kind of requests? 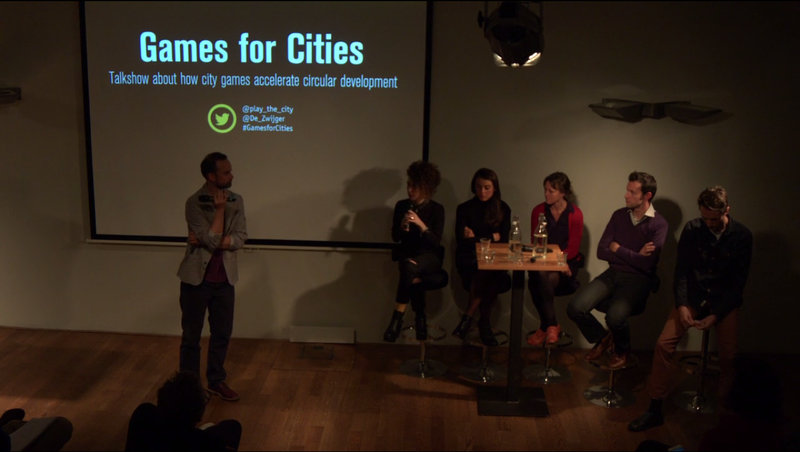 These were the questions on the agenda for the Games for Cities Circularity Talk Show held on October the 11th 2016 at Pakhuis de Zwijger in Amsterdam. The Talk Show hosted a number of distinguished local and international city-gaming experts as well as ‘problem owners’ to discuss the role that serious gaming can play in creating (more circular) cities. Speakers were Kars Alfrink, Lucy Chamberlin, Kasper Lange, Ilaria Mariani, Francesca Miazzo and Ekim Tan. The event was moderated by Michiel de Lange. Why should we turn to games when addressing city challenges? How do games function in an urban setting? How can a cooperation between urban planners and game designers take shape? While ultimately the insights in these questions pertains to any city challenge, during this talk show they were discussed in relation to the concept of the circular economy. 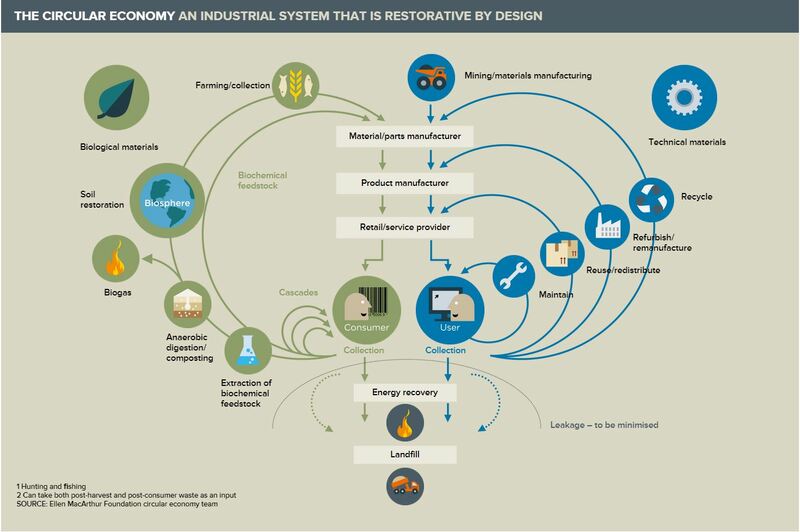 [O]ne that is restorative and regenerative by design, and which aims to keep products, components and materials at their highest utility and value at all times, distinguishing between technical and biological cycles. For Chamberlin the circular economy is valuable as a means for environmental and economic benefits through the sustainable management of resources and it is here that games might contribute. The resources that have to be managed range from raw materials, to consumable products such as clothes and even complete cars. Based on a series of choices to be made by participants in the circular economy, products can be used for a longer period of time resulting in less waste and more efficient production cycles. This however requires these choices to be carefully thought out from a circular economical perspective and participants should be aware of these choices. This is where Chamberlin touched on why games and game designers should meddle with circularity as city challenge (as well as other challenges). A famous quote by game designer Sid Meier is that games are “a series of interesting choices” (Meier in Rollings & Morris 2000, 38). But how can these choices be made interesting from a circular economical point of view. Games are carefully designed systems which, according to Katie Salen and Eric Zimmerman (2010, 53–54), manifest on a formal, experiential and cultural level. What this particular conception of games shows is that these systems, and the choices that form these systems, are assessed on several levels in their design process, often testing the many obstacles a player will encounter explicitly. Game designers then meticulously analyse the many choices the players can make that form the game system. In other words: game design offers a critical and expert perspective that boils complex systems down into a coordinated system of choices. Game design then allows for the simplified explanation of circularity and the familiarisation of the participants in this system. This is illustrated in the RSA circularity game, to which Chamberlin contributed. The game features of a train that follows a track that confronts the players with different design possibilities. Depending on choices the players make, such as what materials to use for encountered mobile phones or what to do with a leftover couch, will determine which path the train will take. If the choices made follow a circular economy the train will ultimately continue its cycle ad infinitum – a symbol of this economy’s sustainability. If different choices are made, the train will crash, symbolising the wasteful behaviour of mankind. The game makes the concept tangible as well as presents the players with the concrete and real choices they can make. Not just will this game design allow more participants to be familiarised with the required choices, the careful analysis of the system and the boiling down into choices makes the complex system more tenable. The design of a circular economy is then benefited by game design due to increased attention to the design of the system. Chamberlin illustrated the value of this game design aspect by stating, with reference to research by the Ellen MacArthur Foundation, that 80% of environmental costs of whatever project are determined in the design phase. While game design cannot ensure that environmental costs will be reduced completely, the intensified attention to system design and the increased appeal to participants will definitely prove a valuable ally, according to Chamberlin. This system value of games is however still abstract and general. To make this value of games more concrete requires looking at what the expectations from the ‘problem holders’ are with regards to the intervention of game designers. Next to Chamberlin the talk show hosted two other ‘problem owners:’ Kasper Lange and Francesca Miazzo. Kasper Lange, from the Hogeschool van Amsterdam, is involved in a project trying to recirculate water, energy and waste flows for better sustainability in several communities in Amsterdam such as NoordOogst. This community contains multiple stakeholders that have to manifest this circularity together. Kasper sees games as a means to facilitate the communication between these stakeholders, which, according to Michiel de Lange is an aspect that games can fulfill (2015, 430). Francesca Miazzo, from the Wasted project, strives to draw attention to plastic recycling and activate citizens in Amsterdam North to participate in recycling. For her, games can be a means to create rewarding experiences, by their nature as entertainment system. Implicit in these expectations by these local entrepreneurs is that games can have an educative value. Playing games could familiarize players with the content matter and the themes. These two ‘problem owners’ illustrated what Chamberlin referred to. The added value of game design is in changing the design process into a more inclusive version or add more meaning to it. Game design then impacts on the main approach to an issue, possibly influencing the environmental sustainability. So why games should be considered for this differs per city challenge and stakeholder. The next question should then look at how games can actually make this happen. Enter the game designers. The talk show hosted two game designers that addressed what the inherent capacities of games can and cannot contribute to urban issues. Present were Ilaria Mariani, game designer and researcher from the Polytechnics design department in Milan, and Kars Alfrink, a Dutch game designer focusing on helping people improve themselves and their environment. Mariani debunked the utopian idea that games can clearly communicate messages. While designers put messages in the game, it takes several translations to reach the players, who can still interpret the message in their own way. To Ilaria, games are more about sharing experiences, positive or negative. That doesn’t mean that games are useless for city challenges, but some critical and modest attitude should be adopted about the capabilities of games. Possibly not working as a solution to the challenge, games, for Mariani, are more capable of engaging citizen with the topic and possibly creating room for dialogue, like Kasper Lange intended. This capacity to create shared experiences is a bit more focused in games that model urban issues. The city setting will have its effects on the shape of the game. What do games have to contend with in such a setting, according to the designers? Alfrink drew attention to the city setting as a space of opportunities. The urban setting allows for impromptu, voluntary, and shared actions. Such ‘unplanned’ games will not necessarily maintain long term engagement needed for solving a city challenge. Pop-up games do however have potential in the city. Running into a game on your way to work which isn’t usually there can incite curiosity or give you a different perspective on the city (de Lange 2015, 432). For Alfrink, pop-up games allowed him to draw attention to certain concepts, phenomena or ideas. For instance, his Camparc saw a huge inflatable ball with a camera inside bounce around a plaza. Through a VR set, citizens could see the camera’s perspective. This pop-up form of play drew attention to the pervasiveness of cameras in the city. Such pop-up games can then be used to draw attention to challenges, but won’t necessarily provide solutions by themselves. However, Mariani introduced some explanations on how games can be used more specifically. Games, especially in cities where people are preoccupied with other things, cannot force players into specific actions. At the same time, the game designer can’t just rely on the player to start engaging with the game or installation spontaneously, for the intrinsic motivation will have to compete with daily life trends such as clocking hours. What the designer can do, according to Mariani, is focus on affordances. Design scholar Donald Norman describes affordances as “a relationship between the properties of an object and the capabilities of the agent that determine just how the object could possibly be used” (2013, 11). Depending on what it looks like, what it’s made of, and what you can do with it, certain designs will make certain actions more probable than others. A table is flat so you can put things on it, but it’s also heavy so you won’t throw it, for instance. By carefully designing how the game is shaped, what it’s made of, and how it is played, the designers can facilitate practices. This way, circular thinking can be hinted at and suggested, but the whole concept will not be conveyed that easily. Building on these affordances, in this case the available actions, Alfrink suggested playability of daily actions. He referred to the Hubbub Ballot Bin, a dustbin for cigarette buds. This bin has two holes, each corresponding to an answer to a question above it. This simple gamification, with updatable question, has kept streets cleaner because motivation to throw away buds is higher. So what this shows is that games in cities will have to contend with daily actions. This could be a problem, but at the same time offers games existing mechanics to exploit. The contributions from the game designers were sobering, but necessary. Games in cities, let alone games for circularity, are not as goal oriented as sometimes imagined. This doesn’t mean that games cannot be used at all. The affordances and pop-up quality can still make games draw attention to topics and motivate people to act. But a key consideration on how these games can be used is that the ‘how’ should be reconciled. The expectations of entrepreneurs should be level with the capacities of games. But what is happening to adjust these expectations? Start the Dialogue! With all cards now on the table, we can start looking at the extent of possible dialogues between ‘problem owners’ and game designers. The following section will observe several areas of overlap and look at these through the critical lens that has been gradually refined through the claims made during the talk show. The goal is to show what possibilities and pitfalls are present in the dialogue between the two parties. At the start of the debate cooperation between entrepreneurs and game designers seemed already in existence. Alfrink and Chamberlin seemed to utilise a similar vocabulary when they both spoke of the system complexity of both games and circularity. Games, as outlined above, are complex systems operated through simplified choices. Circularity, when including all aspects (seen simplified in the figure by the Ellen MacArthur foundation below) is often also simplified to focus on one particular element, like a how the NoordOogst project focuses on waste circularity only. However, when looking more closely at their focus when they discussed systems, Alfrink and Chamberlin spoke of game and urban systems respectively. Chamberlin focused on how the RCA circularity game communicated the system of circularity, or, how the in-game choices conveyed actions to be taken to heart by the players in their daily life. For her, the focus was on communication. Alfrink instead focused on the nature of the game as a game, arguing that the RCA circularity game was more a parameter simulation wherein you can play with a system. The focus in Alfrink’s systems is on the nature of the playability or the choices, not on the meaning per se. Both of the speakers thus judged the system on a different level. The initial conclusion about an already existing vocabulary is premature. The risk of continuing talks with this vocabulary is seeming agreements, but ultimate misunderstanding. This miscommunication of terms or expectations happened on more occasions. For urban entrepreneurs, the main goal when using games is to convey a message to the citizens/players. Again, the focus is on communication – its facilitation, its cultivation, or its functioning. Alfrink and Mariani as game designers instead focused on the player experience (a common design staple (Fullerton 2014, 2)) as the main metric to build a game around. For them, a game must first of all be playable. Your goal may be the noblest in the world, if your game is unappealing no one will engage with it. Game designers do also strive for a goal, but to them it is much more a balance that has to be struck. Circularity, instead of being analysed in its complexity, would then be distilled to a playable model. This will give precedence to some, perhaps less important, elements over others. In order to cooperate, a better streamlining of the design process should be discussed. Kasper Lange foregrounded another aspect that complicates cooperation. He noted that for a game with a goal an important step is evaluation, to see whether the desired effects are met. This led Alfrink to stress that games are not quick fixes to a problem. Lange’s comment was valid in that sense, but it means that using games for problem solving requires evaluation or secondary research steps. What these several forms of miscommunication show is that there are two gaps of interpretation holding back cooperation – a semiotic and expectation gap. The semiotic gap refers to the different interpretations of shared terms. The vocabulary of urban issue games cannot hold multiple entries for every word. What is required is a facilitation of the communication between the parties – a facilitation of the meaning. Before cooperation can be fruitful, the terms used must be scrutinised and compared. The expectation gap stems from confusion about what games can actually do and how urban issues can best be addressed. Knowing what games are capable of can result in better fitting uses. A game suited for spurring interaction between players can then be used as a step in a larger solution, instead of functioning as the solution. Events like the talk show are thus important to attune both parties to the possibilities of cooperation. To answer the question about the possibilities of cooperation then was answered during the talk show by the event itself: game designers and ‘problem owners’ should start with shared events to coordinate expectations and vocabulary, there are regrettably no frameworks already present. The talk show showed that the use of games for city challenges is not a far cry. Games can have a variety of functions, ranging from facilitation of communication to creating awareness. However, the efficiency with which they can communicate complex systems such as the circular economy should be critically assessed. Games in cities can work to foster motivation due to their physical novelty, for instance through a pop-up format, and they can engage a shared community. However, what the player takes from the game cannot be determined beforehand, only facilitated through considerations of affordances. Determination of its effect must be done as a secondary step, instead of relying on the game as a tool to fix a problem with. So ultimately the evening showed that expectations need to be managed and vocabularies synchronized, but that the dialogue between the two parties is one to definitely explore further (for instance during the next Games for Cities events). City-Gaming holds great potential in addressing 21st century issues and the Games for Cities project, an initiative by PLAY THE CITY, has set out to build an integrated community, developing a common language, and supporting newcomers. THE MOBILE CITY and the Lectorate of Play & Civic Media at the Amsterdam University of Applied Sciences, and Utrecht University Media & Culture Studies department have partnered in this project in which researchers and designers explore the role of gaming for complex urban issues. Games for Cities hosts three events in three cities throughout the Netherlands (Amsterdam, Utrecht, and Eindhoven), each dealing with a different urban issue (circularity, inclusion, citizenship respectively). In each city Games for Cities will organize a City game talk show to discuss the modeling of issues into games by actors involved, and a game jam to explore the design of city games. Games for Cities will be concluded with a conference and exhibition in Het Nieuwe Instituut on April 20-21 2016 in Rotterdam. de Lange, Michiel. 2015. ‘The Playful City: Using Play and Games to Foster Citizen Participation’. In Social Technologies and Collective Intelligence, 426–34. Vilnius: Mykolas Romeris University. Rollings, Andrew, and Dave Morris. Game Architecture and Design. Scottsdale, AZ: Coriolis, 2000.